All over the world, enigmatic artifacts have been found that do not fit the accepted geologic or historical timeline. Do they offer a radically different view of our world? 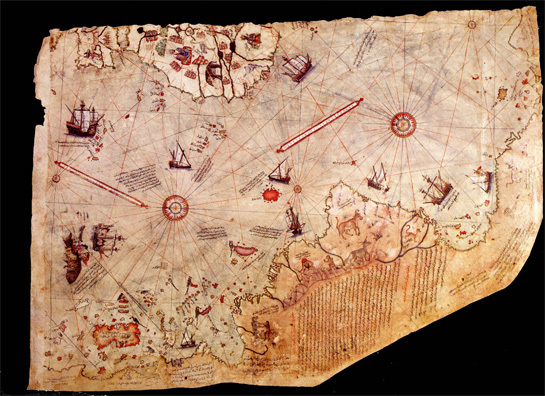 Piri Reis map. Piri Reis, a Turkish admiral and avid collector of old maps, compiled information he had gathered into a map of his own in 1513. Astonishingly, his map depicts the coastal outlines of North and South America – and Antarctica, which was not officially discovered until 1818. Unexplained maps. Scholars aren’t sure what to make of the maps etched on a rock. Do they crudely depict the continents of Earth as they appeared long ago – including the lands of Mu and Atlantis? Or, as some have suggested, do they show the lands of some other planet? To be impartial, however, they also could merely depict divisions of much smaller tracts of land. Ica stones. In 1966, Dr. Javier Cabrera, a Peruvian physician and professor of biology, was given a rock for his birthday from a local peasant. On it was a picture of a fish, allegedly carved thousands of years ago. Upon further study, Cabrera realized the fish depicted was of a species that has been extinct for millions of years. Cabrera hunted down the source of the mysterious rock and found many others like it in Ica, Peru — thousands of them. On them were carved impossible ancient scenes: telescopes, open heart surgery, and even men battling dinosaurs! Egyptian helicopters? Discovered on the walls of a temple in Abydos, Egypt, are hieroglyphics that closely resemble modern aircraft in profile: a helicopter, an airplane, and some kind of hovercraft or flying disc. Strange out of place and time discoveries! So many out of place or out of time discoveries have still not been explained. This is clearly a rocket! Ancient modern tools. While quarrying limestone in 1786, workers came to a bed of sand about 50 feet below ground level. In the layer of sand, however, they found the stumps of stone pillars and fragments of half-worked rock. Digging further, they found coins, the petrified wooden handles of hammers, and pieces of other petrified wooden tools. The sand in which the discovery was made was beneath a layer of limestone dated at 300 million years old. Mysterious vase. In June, 1851, Scientific American reprinted a report from the Boston Transcript about how a metallic vase, found in two parts, was dynamited out of solid rock 15 feet below the surface in Dorchester, Mass. The bell-shaped vase (see photo), measuring 4-1/2 inches high and 6-1/2 inches at the base, was composed of a zinc and silver alloy. On the sides were figures of flowers in bouquet arrangements, inlaid with pure silver. The estimated age of the rock out of which it came: 100,000 years. Too-old screw. 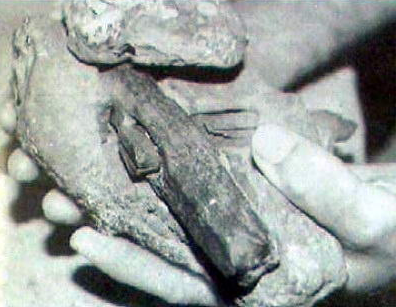 In 1865, a two-inch metal screw was discovered in a piece of feldspar unearthed from the Abbey Mine in Treasure City, Nev. The screw had long ago oxidized, but its form – particularly the shape of its threads – could be clearly seen in the feldspar. The stone was calculated to be 21 million years in age. Ancient nanotechnology. In 1991-1993, gold prospectors on the Narada river on the eastern side of the Ural mountains in Russia found unusual, mostly spiral-shaped objects, the smallest measuring about 1/10,000th of an inch! The objects are composed of copper and the rare metals tungsten and molybdenum. Tests showed the objects to be between 20,000 and 318,000 years old. Grand Canyon mystery. In 1931, Dr. F. Bruce Russell claimed to have found strange underground tunnels in the Death Valley area. According to his story, he discovered winding tunnels containing artifacts that appeared to be a combination of Egyptian and American Indian. There were also mummies there, he said, that were over eight feet tall. As far as we know, no one has ever rediscovered Russell’s mysterious tunnels. Bones in rock. Ed Conrad has found impossibly old fossilized human bones embedded in solid shale rock in Pennsylvania. The bones look human, but the rock in which they were trapped is between 280 and 300 million years old.